LumaForge brings their lab to Las Vegas. 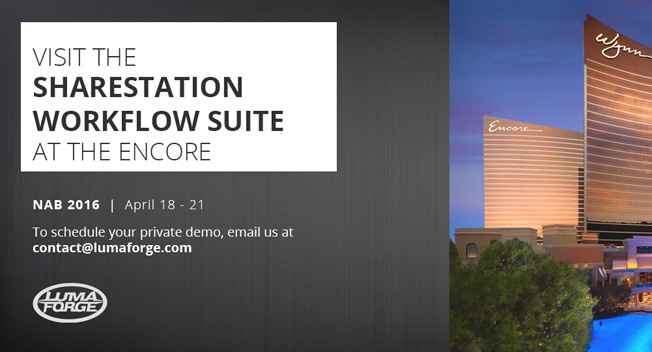 The LA based storage company is instead arranging appointment only demos in their ShareStation Workflow Suite at nearby Encore Hotel. LumaForge’s ability to simplify complex networking and package high performance shared storage into various form factors has opened doors into many segments of the M&E market that have been underserved thus far. The latest advancements in shared storage at this years NAB conference won’t be found on the trade show floor. That’s because LumaForge, the Los Angeles based storage company is instead arranging appointment only demos in their ShareStation Workflow Suite at nearby Encore Hotel. The company’s has gained steady momentum over the past year with a number of high profile case studies featured in various user groups and message boards throughout the web. The most prominent case study came from Swiss National Television; a large European broadcast operation that was months away from abandoning the Final Cut platform after a two-year long search for suitable storage left them empty handed and unable to upgrade their edit bays. In a last ditch effort the team came to LumaForge with their requirements and have been working smoothly on a ShareStation ever since. Additional case studies have been released centered around VFX, Color, DIT, and VR workflows. LumaForge’s ability to simplify complex networking and package high performance shared storage into various form factors has opened doors into many segments of the M&E market that have been underserved thus far. “Traditional SANs are often out of the question for many facilities because of cost and the need for dedicated IT personnel to manage them. It’s these sorts of companies are that could most benefit from getting off sneakernet and onto shared storage, that’s who we’re trying to help.” says CEO Sam Mestman. The ShareStation Workflow Suite at Encore will be open Monday, April 18th through Thursday, April 21st. Clients interested in visiting are encouraged to email contact@lumaforge.com to set up an appointment. The suite will be open for media briefings Sunday, April 17th in the afternoon. PostBox Systems Launches New RoguePro Mobile Studio – Portable Supercomputing on a Budget! Silicon Valley Comes To Hollywood – Well Burbank Anyway!